How does a French socialist (admittedly, a moderate one, but aren't they all ?) advocating what the bourgeois call a confiscatory tax on wealth become an intellectual star in the US ? Though fairly technical, Capital in the 21st century is easy to read (I guess I was not the only one to skip the equation pages). But that would hardly be enough for its author to be called "the modern Marx" by The Economist (probably not as much a compliment as it seems). A main neo-liberal tenet states that inequality lessens as economies mature: "growth is a rising tide that lifts all boats..." It isn't: Th. 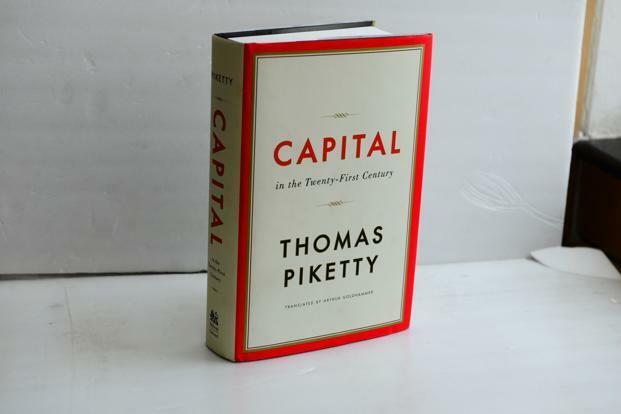 Picketty proves that an ever-rising concentration of wealth is not self-correcting. His book, rich with graphs and data, gives scientific evidence of what has been plain to see for 30 years: contemporary ruling classes have the power to get richer and richer, and they are using this power to the utmost. However, Capital in the 21st century is more than a refutation of the "trickle down" theory. Despite its unassuming appearance, it comes forward with no less than a new definition of the laws of motion of capital, summed up in two letters, r/g : the relation between the rate of return or savings rate (including property assets), and overall growth. All hinges on whether r exceeds or doesn't exceed g. And what does that relation depend on ? It is a by-product of technological and demographic changes, according to Capital in the 21st century. War in the past, and now technology, education and ethical norms, determine (so we are told) the evolution of r/g. This wears a bit thin. In a 700-page book, what historical explanation we find merely refers to the two world wars. The author fails to connect the more equal share in the 1940's-50's-60's with the huge surge in social and political strife in the 30's and its aftermath. Th. Piketty is a conventional economist: good at figures, not much bothered by social history. Capital in the 21st century disregards the specificity of capitalism. It treats production and wealth as categories valid throughout history, as if it made sense to speak of a "rate of return" on money and capital in Rome 50 B.C and in 2014 London. Yet in Ancient times, private wealth did not depend chiefly on wage-labour and markets. People made profits (there were shareholders in Rome) and accumulated wealth, but the system did not suffer from over-accumulation. Capitalism comes with a difference: the co-existence of capital and labour, the permanent productivity drive and the constraints of company competition. Accumulating too much in relation to valorisation possibilities is a compelling necessity in the modern world. And over-accumulating too much capital relative to the economy as a whole threatens the level of private returns, general expansion, and eventually political stability. This may sound over-simple, but it brings us closer to the heart of the matter than the r/g formula. Piketty replaces the problem of the profit rate with the problem of the wealth rate. The bottom line is, he equates capital with wealth. Unlike his 19th century predecessor, "the modern Marx" does not inquire into the dynamics of accumulation. The author of 1867 Capital did not think the bourgeois were bourgeois because they were rich: they were rich because they were part of a certain class. Idle bourgeois rarely become billionaires: the famous French Liliane Bettencourt ($ 37.8 B) happens to be the widow of a highly successful businessman. Divergent incomes for capital and labour reflect not an unequal contribution to production, but prior disparities in ownership. What separates those who control the means of production, from those who don't ? Asking this question is irrelevant for Piketty, who perceives classes as statistical categories, not as living interrelated groups with conflicting interests. There is no need to be a Marxist to understand that the reality of class underlies the evolution of Western society in the 20th and 21st century : "There's class warfare, all right, but it's my class, the rich class, that's making war, and we're winning", business magnate Warren Buffett said, but that is too basic for sophisticated Piketty to acknowledge. So why does such a book become a best-seller in the heart of global capitalism ? Because of a growing awareness that over the top inequality is detrimental for capitalism: returns to capital (i.e. bourgeois income) cannot keep on rising faster than economies are growing. Therefore voices of moderation are most welcome, providing the moderator is no maverick: "I am a defender of the free market and private property, but there are limits to what markets can do", declared Th. Piketty after writing a top-down analysis that calls for a top-down solution: tax reform. Nothing excessive: "You can't say that 1% off the wealth of the richest will kill the economy." And not just in one country of course: a world government would impose a world tax on capital. This is a naïve view : it took decades to implement the income tax, and that coincided with social upheavals, because social alleviating implies mass social pressure, in plain words strikes, demos, marches, riots, which are not factored in economists' equations. Far from being an intellectual breakthrough, Capital in the 21st century is a symptom of reform breakdown. It takes more than brilliant theorists for capital to self-control. The New Deal went with millions of workers on strike, huge factories occupied and the rise of the CIO. "If you don't give the people social reform, they will give you social revolution", a Tory politician said. After 1945, without a strong union movement, reformist yet militant, in the US, in Western Europe and in Japan, there would have been no Welfare State. Nothing of that sort is happening in the West and Japan these days. "Reform" today means more sacrifices for labour. Before being elected, the present "socialist" president of France declared "the world of finance" to be his "enemy" and promised to introduce a 75% top income-tax rate: needless to say, once in power, he did nothing of the sort. Th. Piketty is 80 years late. He would have excelled among Roosevelt's fabled brain-trust.